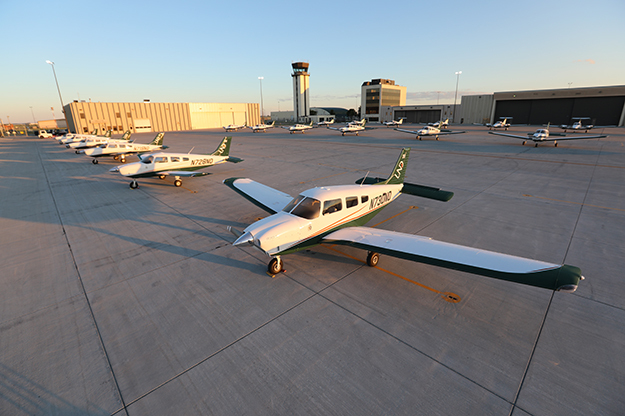 Part of UND Aerospace’s fleet of aircraft stand ready for students-pilots to train. UND is coming off a record year for student flight hours flown, by far the most of any collegiate flying program. It’s one sign of success currently being enjoyed by the John D. Odegard School of Aerospace Sciences on a number of fronts. Photo by Jackie Lorentz/UND Today. Jim Higgins and Kent Lovelace went to Washington D.C., in 2009, on behalf of the U.S. Department of Defense to present findings from their first pilot-supply forecast. The country was in a recession and many pilots were furloughed. At the time, none of the aviation industry’s stakeholders—airlines and military branches alike—was worried about a shortage. They stood by their findings, and two years later another forecast was published. The message was consistent. By this time, the regional airlines started seeing the signs. Pilots began aging out, and the rate of recruitment wasn’t keeping up with the exodus. Airlines started coming to UND for advice. 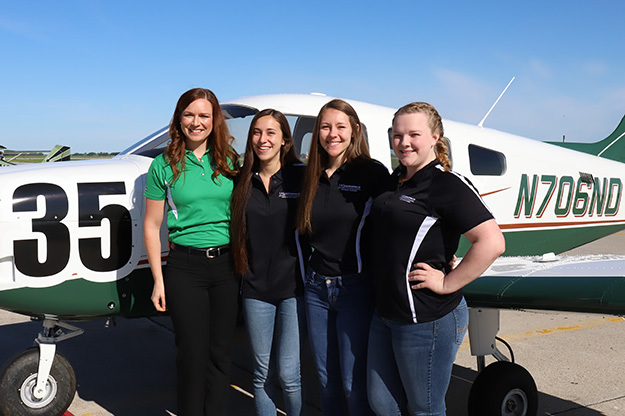 From left to right: UND Assistant Chief Flight Instructor and coach Erin Roesler, Monique McAnnally, Dakotah Osborn, and Jenna Annable stand in front of ‘Evelyn’, the Piper Archer aircraft they flew in 2018’s Air Race Classic across America. Photo by Connor Murphy/UND Today. Almost 10 years later, Lovelace, the school’s director of aviation industry relations, and Higgins’ research has been vindicated. 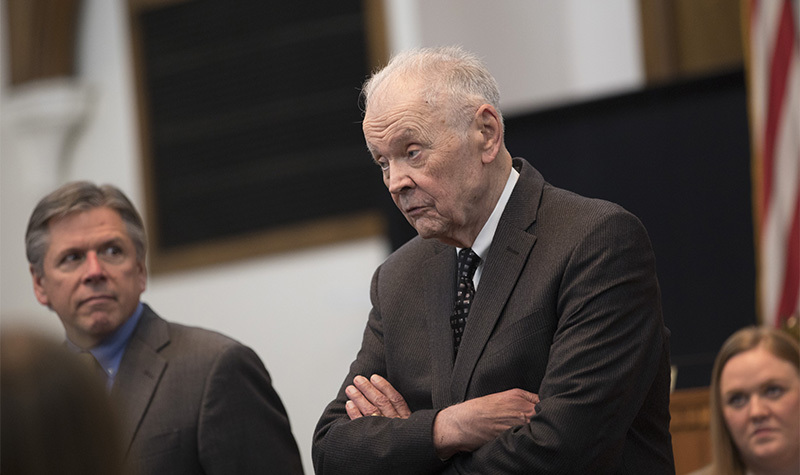 The two now find UND Aerospace in a “perfect storm”: Hiring top-notch aviators is critical to the aviation industry, opportunities in air traffic management and unmanned operations are surging and enrollment has risen exponentially. In other words, UND Aerospace not only remains strong, but it is needed now more than ever. 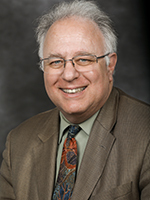 Assistant Dean Ken Polovitz, who’s been with the school for 30-plus years, says there’s never really been a dull moment. Tim Leonard (left), vice president of flight operations for FedEx Express, helps hold a $500,000 check awarded to UND through the FedEx Purple Runway Aviation Scholarship Program. 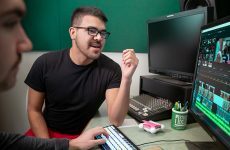 UND was one of seven schools that received funding to help students earn flight instruction ratings from FedEx Express. Also pictured, from left to right, are Aviation Department Chair Jim Higgins, Associate Dean Elizabeth Bjerke, Director of Aviation Industry Relations Kent Lovelace, Dean Paul Lindseth and Vice President of Development, Leadership Gifts Dan Muus. Photo by Connor Murphy/UND Today. The pilot-supply forecasting by UND led to a boom in career pathway opportunities for aspiring aviators. In 2018, alone, UND partnered with major airlines such as United and Delta and Sun Country among others – remarkable milestones that recognize the University for its established standard of excellence. 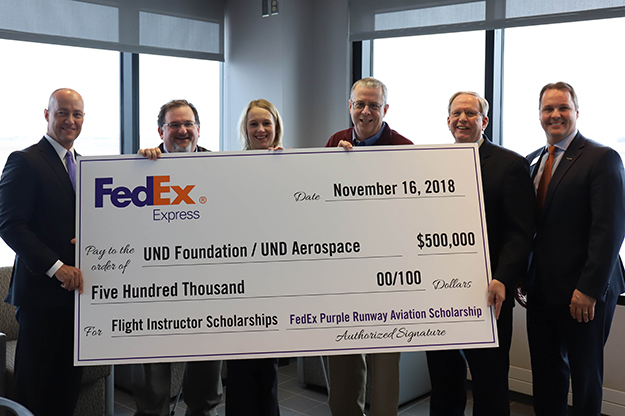 FedEx Express’ $500,000 contribution, through the Purple Runway Aviation Scholarship Program, was among the first from a major airline to the school. It directly incentivizes students to stay at UND as flight instructors. Higgins pointed to student applicant numbers to show how the pathways have impacted the school. 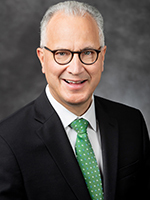 And when UND Aerospace does well, the ripple effect touches the entire campus, said Jed Shivers, vice president for finance & operations/chief operating officer. 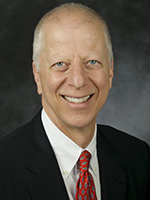 “The significant demand for instruction in aviation keeps not just the John D. Odegard School financially strong, it strengthens the entire University,” Shivers said. 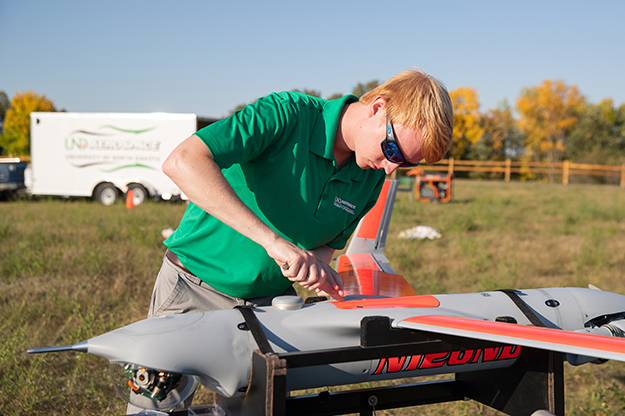 UAS educators and researchers from UND Aerospace and the Research Institute for Autonomous Systems (RIAS), also based at UND, are pioneering the autonomous system industry with a number of cutting-edge research projects. Photo by Shawna Schill/UND Today. While aviation education is booming, it’s the research that keeps UND at the fore of all things aerospace. UND’s efforts in autonomous systems also have had pioneering impacts beyond North Dakota. That was clear on Dec. 21, when the University, along with the Northern Plains UAS Test Site and its industry partners achieved a major milestone with the first-ever successful tests of a beyond-visual-line-of-sight network – a huge step toward integrating UAS in the national airspace system. UND’s UAS research has attracted industry leaders such as Harris Corporation, Northrup Grumman and General Atomics to the region. In Space Studies, Pablo de Leon’s work with spacesuit technology is recognized worldwide. The Inflatable Lunar/Mars Habitat, which just completed its sixth mission, is the only of its kind on a university campus. “Looking forward, I think that research will expand even more as space travel becomes more pronounced,” Lindseth said. Bjerke says she loves talking to faculty about the exciting research happening throughout the school. 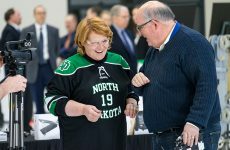 UND President Mark Kennedy said the benefits of having UND Aerospace as part of the University community is immeasurable — from important research to vibrant academic programs that intersect other Colleges to the establishment of a more diverse student body.